In the Nepali village where my daughter was born, rice and dal (lentil soup) is the usual mid-day and evening meal. Chicken is typically reserved for honored guests, or a special occasion. But when her maternal grandfather, Chandra Tamang, would join us for breakfast, lunch or dinner at our hotel, he always ordered chicken curry. 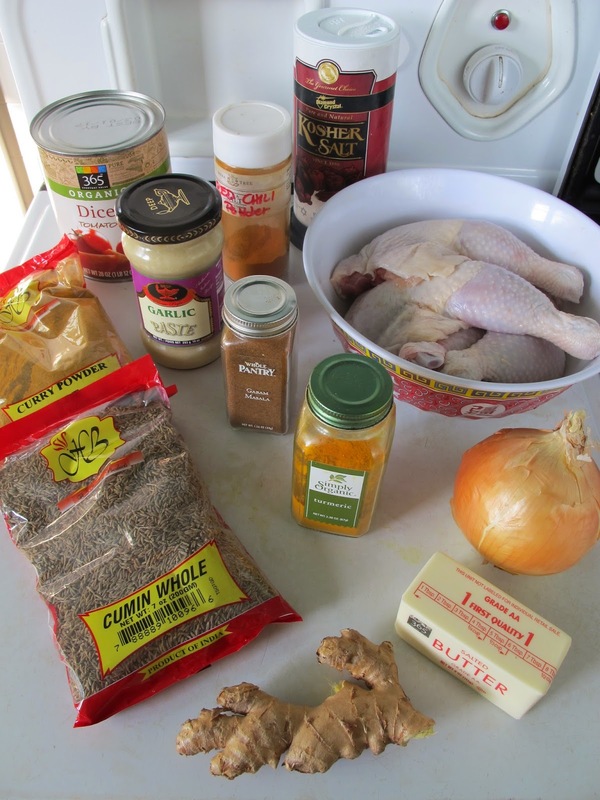 In his honor, we worked together on this recipe for Chandra's Chicken Curry. Melt 2 sticks of butter (1 cup) in a small pot. When the white milk solids bubble to the top, discard them with a spoon. Let the butter cook until it turns a golden color. Drain the oil through cheesecloth to catch the brown particles. 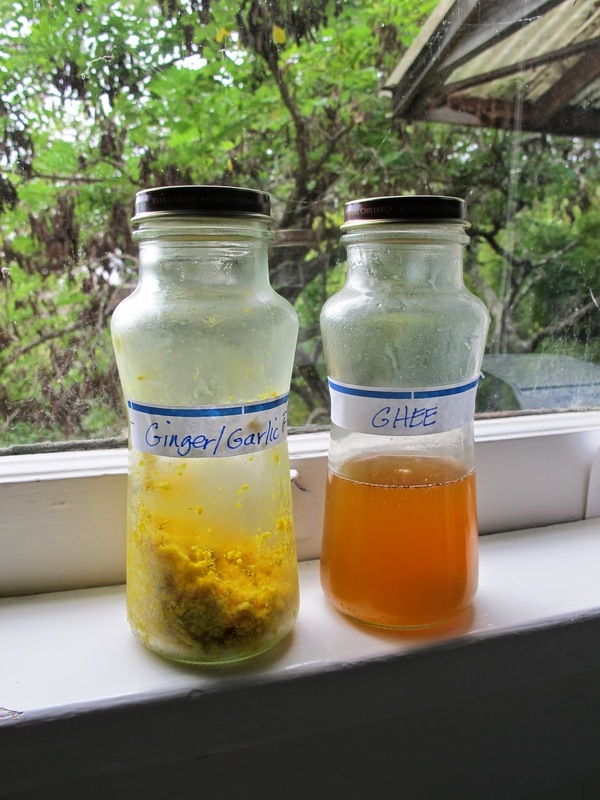 Let the ghee cool and store in a jar or container. Put all ingredients for ginger/garlic mixture in a food processor to combine. Store in a jar or container. Put 4 tablespoons of ghee in a cast iron pot. The ghee will heat up very fast. Add the cumin seeds; let them cook for about 1 minute. Add the ginger/garlic mixture; stir this all together constantly until very fragrant. Add the turmeric, curry powder, and chili powder; stir. Add about 1/4 cup of water and stir to allow the spices to blend all of their flavors together. Check for taste. Add the chopped onions to the spice mixture (and more ghee if needed). Cook the onions down for a few minutes. Add the drained chopped tomatoes and stir until the mixture looks like jam, about 5 minutes. When the tomatoes have thickened, push them to the back of the pot with a wooden spoon. Add 1/2 the chicken pieces in the front of the pan and lightly brown on all sides for a couple of minutes. Put the browned pieces on top of the tomatoes and add the rest of the chicken to the cleared space. When these pieces have browned, stir the mixture all together and add salt. Add the water and tomato juice to cover the chicken. Bring the liquid to a boil, then turn the heat down to medium, cover with the lid, and cook the chicken throughly for 30 -40 minutes, depending on the thickness of the pieces (chicken temperature should be 165 degrees F with instant read thermometer). Stir occasionally. 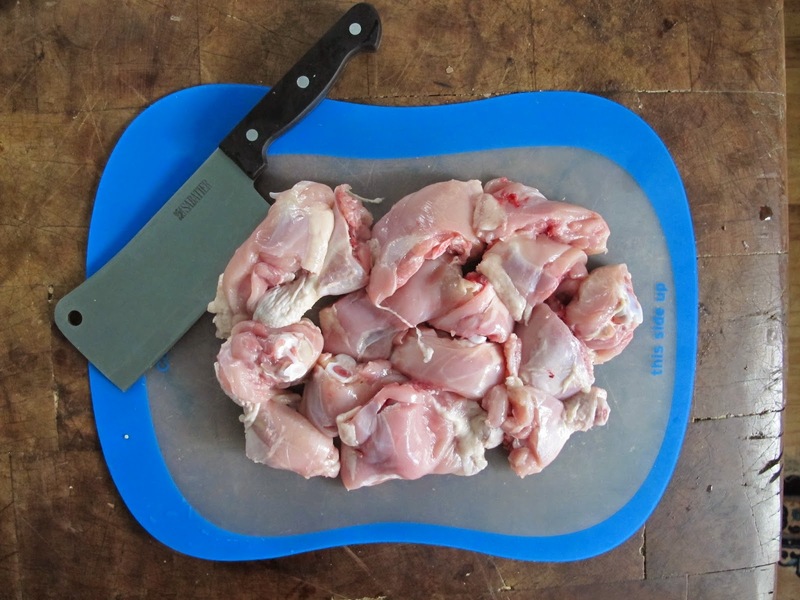 The chicken will start to fall off of the bone when it is done. Add the garam masala, stir and let simmer uncovered for 5 more minutes. Adjust for salt. Serve with rice and/or salad. Recipe updated on 4.6.18 by Chandra’s granddaughter, Anu Tamang Vaughan, shown in “About Me” photo above.